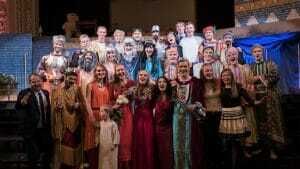 Play based on Bible character performed in eight cities across the country. A creative evangelism project co-sponsored by the Latvian Conference church region of the Seventh-day Adventist Church, the Pathfinder department and the Trans-European Division Mission board has shared the story of Daniel with over 4,500 Latvians in eight cities. Twenty-four young, non-professional actors joined more than 35 musicians, technicians, dressmakers, filmmakers, photographers, and many assistants to bring The Secrets of Daniel to life. The Pathfinders ministry has a major presence in the Latvian church with many youth, both from inside and outside the church, attending clubs across the country. The highlight of their year is always the summer camporee, a place where many commitments to Christ are made. President of the Adventist Church in Latvia Vilnis Latgalis believes Pathfinders Clubs are one of the best outreach programs. “[Last year,] they attracted 600 youth to summer camps, with up to half of them from non-Adventist backgrounds,” he said. The Secrets of Daniel was first performed in July at Latvia’s 20th Pathfinder camporee before going on tour through the autumn at 12 venues in eight cities. According to Baltic Union Youth director Mindaugas Pikūnas, outreach was prepared as “an alternative theatrical play” to encourage visitors to think through issues and develop a positive sense of life now, together with a hope for a better future. 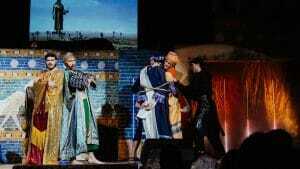 It seemed to succeed as, with its grand stage decorations, actors, costumes and performance, it captivated the attention of children, teenagers, young adults and grown-ups—Christians and non-Christians alike. “Daniel’s faithfulness is something we all should ponder upon, so that our characters may be transformed,” Pikūnas said. He shared how the play recounted events from the first six chapters of the book of Daniel, carefully weaving in themes such as healthful living, prophecy, and the Sabbath. Public reaction was very positive, as many purchased books, asked questions, and committed to Bible studies. Some who had slipped away from faith confessed that it had brought them back towards belief. While attendance was not completely free, the main reason for the play was to attract public attention, and each venue was carefully chosen as a well-known city location where people would want to spend an evening out. Profits from ticket sales are being invested in future productions. The team celebrated the news, as the activity was a blessing also for them. “The time [we] spent together in rehearsals, prayer and fellowship, drew [us] closer to God and to one another,” they said.